You can apply operators to your report data so that you either filter or highlight data based on criteria you define. You can apply multiple filters to a report and you can apply filters to filtered data. If your active dashboards contain multiple reports, you can apply a global filter to all reports. A global filter is a filter that is applied to reports that contain the column you are filtering on. Equals. Equals a specific value or values. If you select more than one value, OR logic is used to retrieve records. Not equal. Does not equal a specified value. Greater than OR Greater than or equal to. Greater than or greater than or equal to a specific value. Less than OR Less than or equal to. Less than or less than or equal to a specific value. Between. Between a set of values. Contains OR Contains (match case). Finds values that include a character string you specify. The string can occur in any position in the value you are testing. You can use this option for case-insensitive (Contains) and case-sensitive strings (Contains (match case)). Omits OR Omits (match case). Finds values that do not include a character string you specify. You can use this option for case-insensitive (Omits) and case-sensitive strings (Omits (match case)). 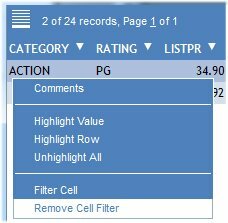 Click the arrow in the heading of the column you want to filter on. Click Filter and then the operation. The Filters Selection dialog box opens. You can change the operation after you select it. Enter a value or values, depending on the operation you select. Values are entered, either by typing a value in a text box, or selecting a value from a drop-down list. Click Add Condition if you want to enter additional filters. If you are adding additional filters, you can apply either AND or OR logic. AND logic considers all filters and all data must pass all filters in order to be included in the report output. OR logic considers filters independently and includes data that meets any of the applied filters in the report output. Once you apply a filter or highlight, and minimize the selection dialog box, the selection dialog box appears as a button (Filter Selection or Highlight Selection) in the bottom of the window. You can click the button to access the dialog box. If you close the dialog box, all filters and highlights clear from the report output. In the Filter Selection dialog box, click the X adjacent to the filter or highlight you want to remove. To remove all filters or highlights, click Clear All. Also note that if you close the Filter Selection dialog box, all filters clear from the report output. When you select a value in the Filter Selection dialog box, a value selection dialog box displays if there are more than 20 data values. Additionally, when items are selected in the value selection dialog box, the item is highlighted and checked to indicate the selection. Selecting multiple values is available for Equals and Not Equal conditions. The Filter Selection dialog box opens. Values are entered either by typing a value in a text box or selecting a value from a drop-down list. If there are more than 20 data values for the column, a value selection dialog box opens, as shown in the image below. For more information about selecting values to be filtered, see Usage Notes for Selecting Values. Select a value, or values, in the value selection dialog box. The items selected are highlighted and checked, as shown in the following image. While the value selection dialog box appears for both alphanumeric and numeric data, indicated selections only appear for alphanumeric data. Close the value selection dialog box to add your selections to the Filter Selection dialog box. Click Filter to apply the filter to the report. Filtering data in the Scientific Notation format is not supported. Applying a filter to an active report with a calculation applied to a numeric column correctly displays the filtered percentage. The filtered percentage does not appear for non-numeric columns. If no records are returned after applying a filter, the Status Bar states Page 1 of 1 and, for example, 0 of 10 records. 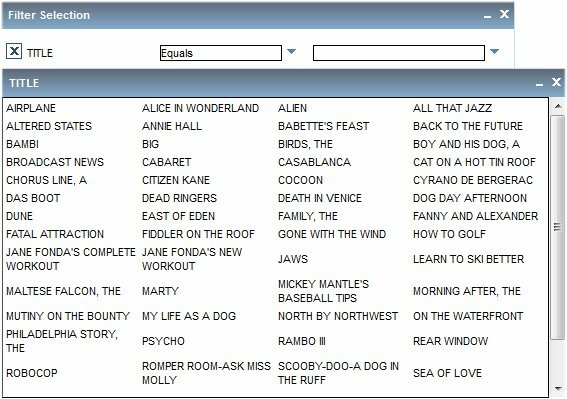 If there are less than 20 unique values in the matching records to be filtered, they will be displayed in a drop-down list, as shown in the following image. You cannot type input values in the filter field. If there are more than 20 and less than 1,000 unique values, the value selection dialog box appears, as described in How to Filter Selections Using Multiple Values. You may not type input values in the filter field. If there are more than 1,000 unique values, there is no value selection dialog box or filter value drop-down list. Manually type the input value in the filter value field. When a filter is applied to a report with calculations, the report refreshes and the calculated column total shows the value for the filtered data. A calculation icon appears on the pagination bar, enabling you to toggle between calculation types for the filtered data. The calculation icon only appears when a filter is applied to a report with calculations. Click the calculation icon on the pagination bar to toggle between calculations for the filtered data. Note that the column total value changes accordingly, as shown in the following images. In addition to using column controls to filter and highlight your report, you can also filter, highlight, and comment individual rows of data in the active report output. When a row is selected, the context menu offers options to add comments, highlight values and rows, and filter cells. 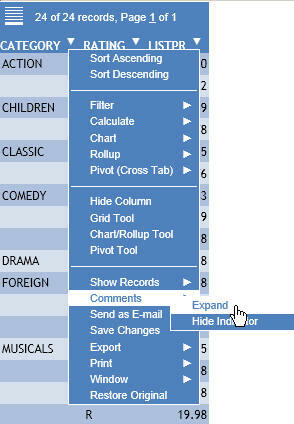 For example, the following image shows the context menu for a row in the active report output. You can add multiple comments per row. Comments cannot be edited but they can be deleted. Select the row of data that you want to add a comment for, click and select Comments from the context menu. The Add Comment dialog box opens. Type in a comment in the Enter Comment field. Click Add Comment to add the entry and close the dialog box. A comment icon indicates that there is a comment in the row. If you are using WebFOCUS theme and style files that are packaged with the product, an earlier version of the comment indicator [*] may be displayed, as shown in the following image. Click the row with comments, and select Comments from the context menu. The Add Comment dialog box opens displaying the comment entry and the date it was created. Select Expand from the Comments submenu of any column control. The comment date and entry is shown in the output. Click the X next to the comment date and entry. Click the X on the Add Comment toolbar to close the dialog box. Select the row of data that you want to highlight, and click and select Highlight Row from the context menu. The row is highlighted in yellow. You can highlight multiple rows. Select the row of data that you want to highlight, and click and select Highlight Value from the context menu. The row is highlighted in an aqua color. Highlight Value is only applicable for one row. When you apply Highlight Value, any other highlighted rows are unhighlighted. You can use the context menu to highlight other rows, unhighlight the row, or unhighlight all rows. The filter option enables you to filter the output and only show a selected row of data. Select the row of data that you want to filter, and click and select Filter Cell from the context menu. The output refreshes and only shows the filtered row of data. Select Remove Cell Filter from the context menu to remove the filter and return to the original output results.